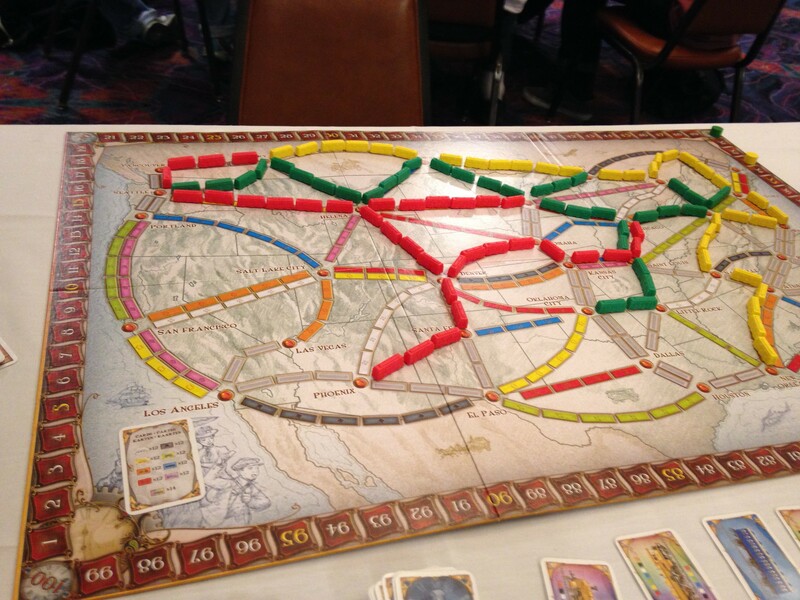 Ticket to Ride is another game we saw on Tabletop, and one we reference a lot (nerd rage!). Professor and I have this game on our tablets, and we have played it a couple times. I think I prefer the physical game. One of the times we were playing on the tablet, it had a little glitch and placed my trains in a completely random place. It was evident early on that we all had similar Destination cards, and unfortunately Space Cat was cut off from Vancouver (-20 points, ouch!). I tried to divide and conquer by playing from Seattle towards New York City and playing from Dallas to New York City. Things got pretty crowded up north, so I was forced to rethink my strategy a few times. Drawing new Destination cards makes me nervous, but there are advantages to it. I was lucky enough to draw Calgary to Salt Lake City which was easy enough for me to do based on where my trains were already. Even though Space Cat had the longest train route, that -20 took her out of the lead and let Professor overtake her. Game play is really fast. Players either draw cards or place trains, so turns are super quick. This gives a certain urgency to the game. You don’t want to get cut off from a city, and you don’t know what the other players are up to, so you feel like you need to start placing trains as soon as you can. Even later in the game, you want to get to your destinations and use as many trains as possible before someone else ends the game. The base game allows for up to 5 people, but at least one expansion brings the total players up to 6.